The Five Little Ducks, which were first introduced in Duck Dunks and Duck Skates, are back! This time they are going camping, and as usual, there are mishaps and mayhem along the way! 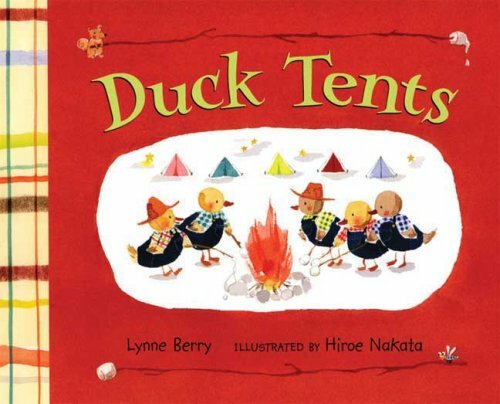 Hiroe Nakata’s beautiful watercolor illustrations are particularly striking as they depict the ducks pitching their tents, on a fishing expedition, and toasting marshmallows (my favorite one was the gigantic fish–“We lost the big one!” five ducks cry). The story also deals with scary night-time sounds, as the little ducks hear a very loud, “Whoo! Whoo! Whoooooo!” outside of their tents. The engaging rhyme makes this tale a perfect read-aloud book, and it also is a great resource for first time campers. <a href="https://www.thechildrensbookreview.com/weblog/author/amanda-lynch">Amanda Lynch</a> is a writer, editor, and blogger who grew up in Florida knowing she belonged somewhere else. She now lives in the DC Metro Area with her husband and three amazing little boys. She is the Eco-Friendly/Green Living Contributor over at the <a href="http://www.primeparentsclub.com/author/amandalynch/">Prime Parents' Club</a> and strives to live earth friendly in a world of disposable diapers. When not writing about Anabel and Jared or chasing around a curly-haired boy, she cheers for the Gators (in all kinds of weather) and occasionally remembers to sleep. You can also find her on <a href="http://www.facebook.com/AmandaLynchWriter">Facebook</a>, or on Twitter as <a href="http://www.twitter.com/thebookprincess">@thebookprincess</a>.